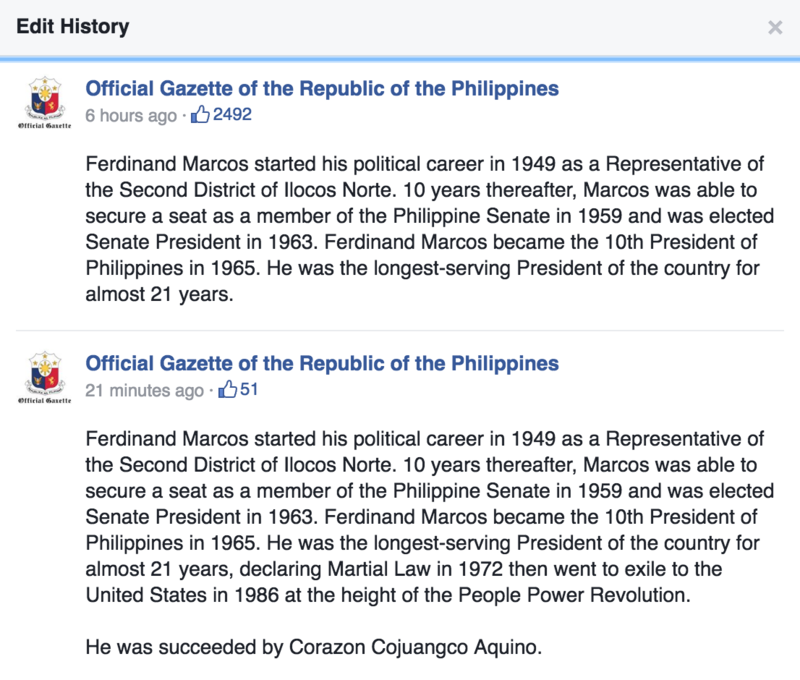 MANILA, Philippines (3rd UPDATE) – In just the span of a few hours on Sunday, September 11, the government’s Official Gazette posted a photo of Ferdinand Marcos on Facebook, edited the photo’s caption, deleted the photo altogether, and then reposted the photo with a shorter caption. 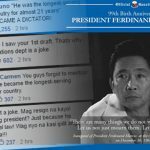 The changes were prompted by a barrage of comments from social media users, who accused the Philippine government of historical revisionism and downplaying the Martial Law era under Marcos, which saw rampant human rights abuses and corruption. It wasn’t the quote, however, that angered social media users. 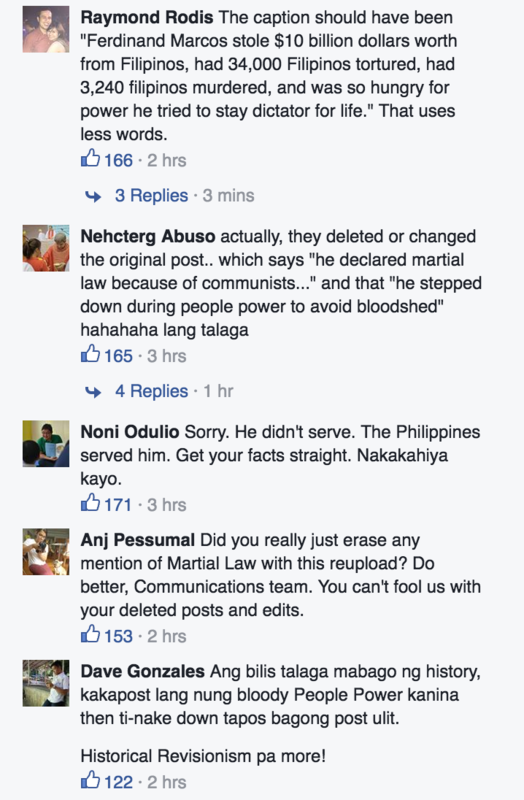 The post, however, continued to receive negative comments, with people pointing out that the government seemed to set aside the suffering of Filipinos under the Marcos regime. The Official Gazette then deleted the photo. 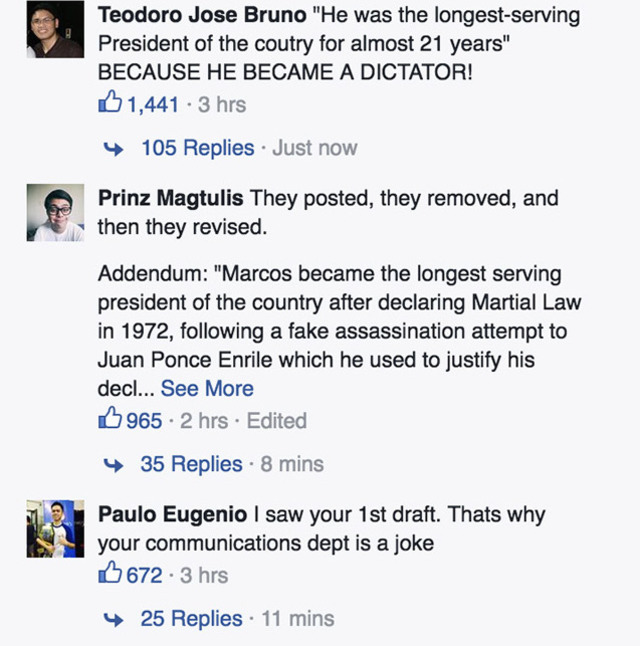 This triggered another flurry of comments from social media users. Very early on Monday, September 12, the caption was edited yet again. Below is the latest Edit History comparing the most recent version of the caption with the one right before it. 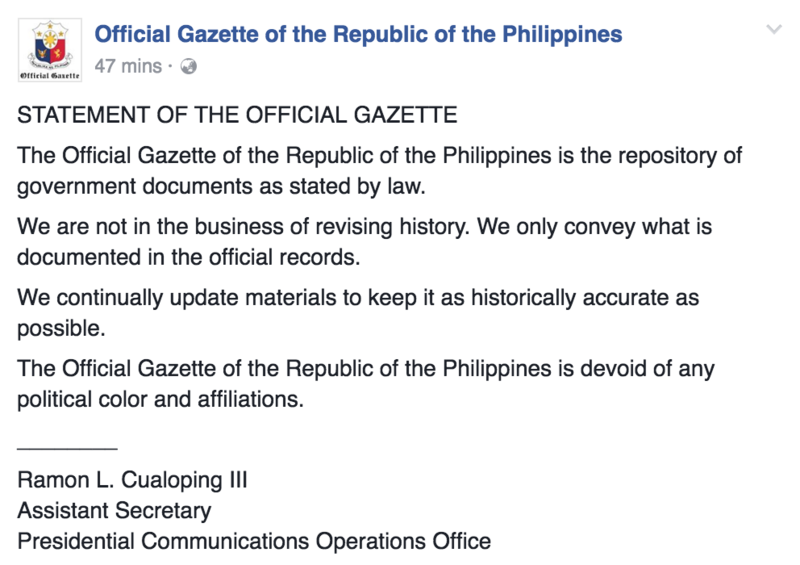 On Sunday, shortly before midnight, the Official Gazette issued a statement, denying it committed historical revisionism. 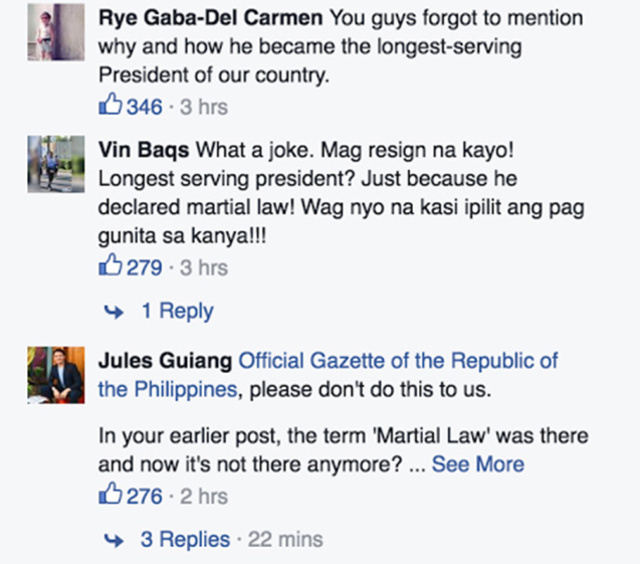 “The Official Gazette of the Republic of the Philippines is the repository of government documents as stated by law. We are not in the business of revising history. We only convey what is documented in the official records,” said the statement, attributed to Presidential Communications Office (PCO) Assistant Secretary Ramon Cualoping III. 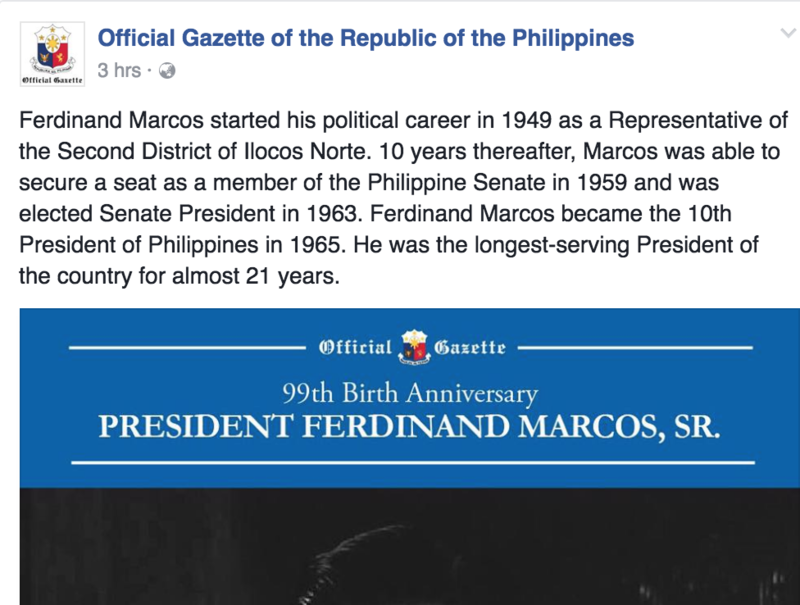 The statement was met with more negative reactions, with Facebook users saying that the Official Gazette’s photo caption was clearly “pro-Marcos” and “conveniently left out key info” about the dictatorship. According to Amnesty International, about 70,000 people were imprisoned, 34,000 were tortured, and 3,240 were killed during Martial Law from 1972 to 1981. 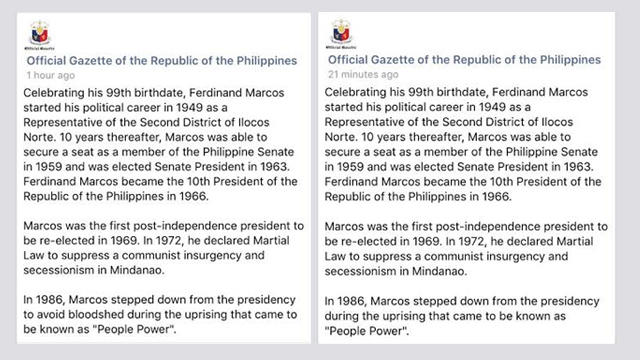 Various estimates also put the Marcoses’ ill-gotten wealth at between $5 billion and $10 billion. 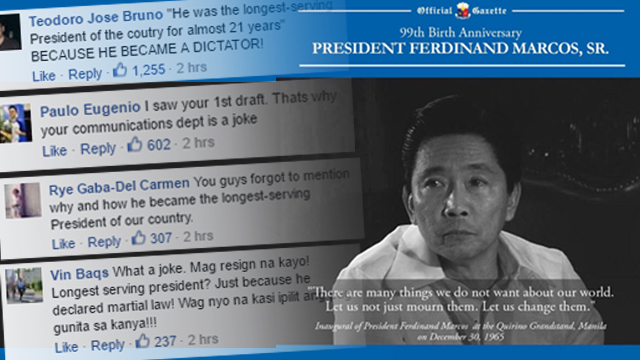 The late dictator’s son and namesake, former senator Ferdinand “Bongbong” Marcos Jr, has repeatedly said his family will not apologize for his father’s rule. 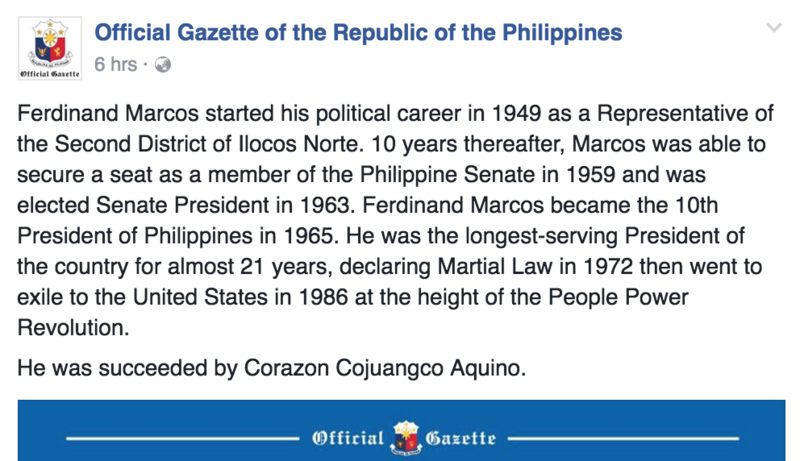 The Official Gazette’s controversial Facebook post comes amid heated debate on whether or not Marcos should be buried at the Libingan ng mga Bayani (Heroes’ Cemetery) – a battle that has reached all the way to the Supreme Court.